I can see my neighborhood from space. It’s a bit tricky to spot, and you have to know precisely where to look, but it’s there near the far right-hand side of an extraordinary digital photograph of Southern California snapped in October by a NASA astronaut with a handheld digital camera from the International Space Station. 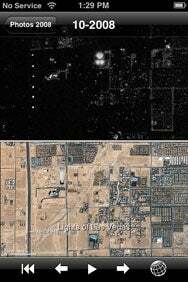 Bright Lights, Little City: Earth Envi shows you what the Vegas Strip looks like from space, both at night and by day. I know this because I saw the photo on Earth Envi. And then I downloaded the full-size, high-resolution picture from NASA’s Web site. Earth Envi by Open Door Networks, serves up Web-based images of the planet on the iPhone and iPod touch. It serves no purpose, really, other than to look at gorgeous images on a small screen. The app gives you access to classic NASA images from Apollo missions in the 1960s and ’70s, to satellite photos captured this week. Earth Envi is part of the iEnvision group of Web-based photo browsers. It’s one of several space-related Envi apps, which include Astronaut Envi, Planet Envi, Space Envi and Space Envi Deluxe. Earth Envi collects hundreds (thousands?) of images from numerous sources and assembles them into slide shows broken down by topic and date. You can browse dozens of groups, such as “Images of the Day,” and global climate maps showing natural disasters, changes in Arctic ice, and other wonders of the world. When you find a show that interests you, simply tap on the show and watch. As with any photo on the iPhone or iPod touch, Earth Envi lets you pinch, expand and view images in landscape mode (a must in most cases). You can also tap on the screen for play and pause controls, as well as to move back and forth among the images. Because Earth Envi draws on Web images, you need a Wi-Fi or 3G connection for the app to work. And even then, Earth Envi is slow to load the images you want to see. There is usually a delay between screens in the slide show. In theory, you can shorten or lengthen the image display time in preferences, but I found that this didn’t make much difference. Impatiently tapping the forward button, as you might be tempted to do, hastens the next picture only a little. This is an app for people with leisure time. I have a couple of other quibbles with Earth Envi. Like most Americans, I did not take a course in college on the art and science of interpreting satellite photography. All of the images are ripped out of context and in need of captions. (The preferences also give you the option of turning captions on and off. Although I have this switched on, captions never seem to display.) Earth Envi’s remedy is a globe button on the slideshow controls, which lets you see the image in the context of its original Web page in Safari. But it’s an imperfect solution that takes you out of the app. To the developer’s credit, however, you will return to the image you left off when you re-launch Earth Envi. Although the app does hold your place, it could really use a history or a bookmark feature that would let users flag their favorite images or slideshows. Truth is, many of pictures you see on Earth Envi need to been viewed in a larger format to be appreciated fully. That astronaut’s snapshot of Southern California is truly astonishing—and best savored on nothing smaller than a 20-inch monitor. Earth Envi is a pleasant diversion of an app. But when the app boasts “the whole earth in your pocket,” I can’t help but reflect that on my iPhone’s screen, it truly is a small world, after all. Earth Envi is compatible with any iPhone or iPod touch running the iPhone 2.1 software update.